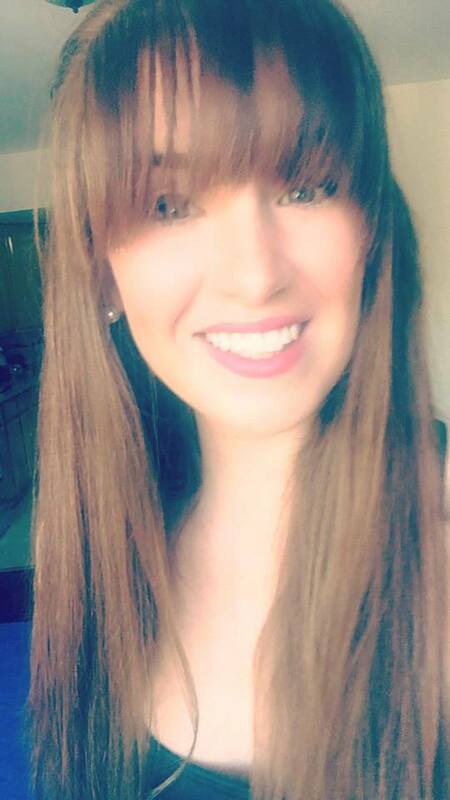 Have you always considered yourself a daddy’s girl? If so, you may have also thought about getting a father daughter tattoo…that is, if your dad is down for some ink! If he is, take a look at these design ideas that will totally make you #fatherdaughtergoals. 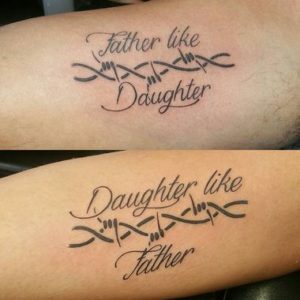 This father daughter tattoo design is just so sweet. 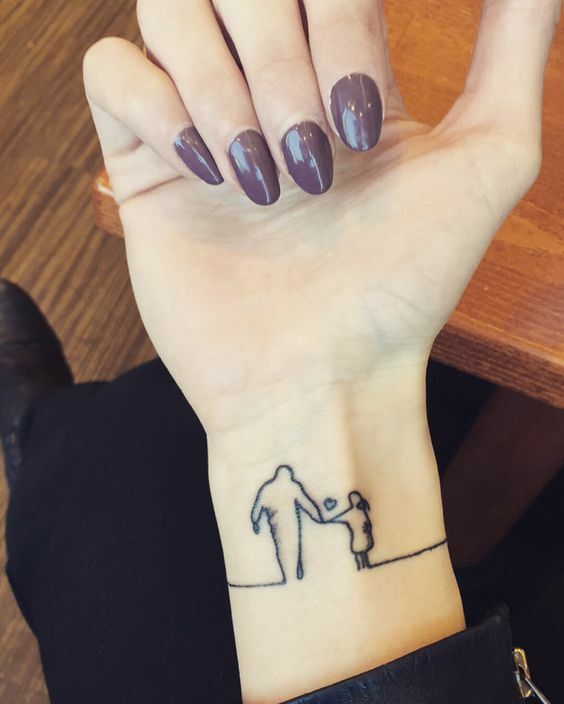 The image of the little girl holding her father’s hand will stay with you as a constant reminder of how you will always be daddy’s little girl. And, how your father will always be there to hold your hand and walk you through life when things get tough. The sweet note, “As long as I’m living…my baby you’ll be” is written in beautiful script that will remind you that you will always be someone’s baby. You don’t have to worry about falling, failing, or being alone because your father will always be there to take care of you when you feel helpless. A tattoo written in your father’s handwriting is not only personable but unique. 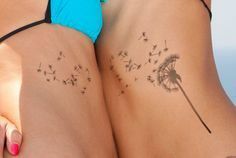 There is a definite guarantee that no one will have a tattoo exactly like this. So, have your dad write up something short and sweet and find a spot to ink it on your body. Then, do the same for Dad. Pinky promises are a universal sign of loyalty. And, what is more loyal than a father daughter relationship? Family is always there for you through the roughest times. 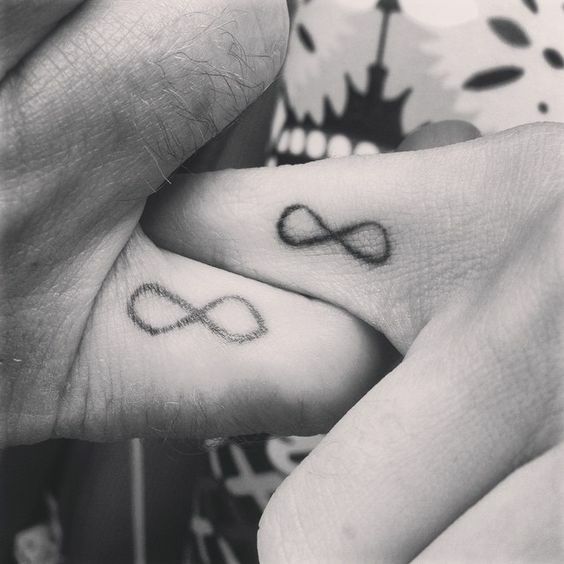 This pinky promise represents the strong bond between a father and daughter. 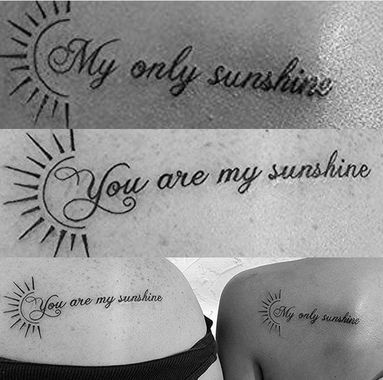 It states that no matter what they will always be there for each other. Images of trees represent growth. And, this tree is unique because of its long roots. So, not only does this father daughter tattoo symbolize the never-ending growth of the relationship, it also represents family roots and that family runs deep. 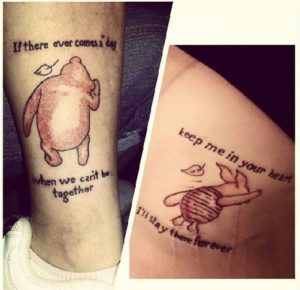 This famous Winnie the Pooh quote is perfect for that father daughter duo who still have a special place in their heart for this silly bear. It also shares a quote that lives long past human life, stating that even when we are not together, you’ll be in my heart. 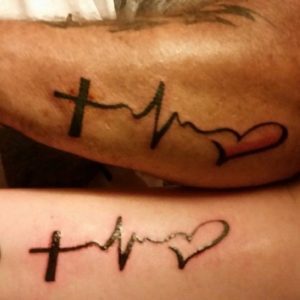 These simple hearts are a great option for a father daughter tattoo because they are small but meaningful. 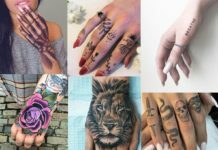 Tattoos aren’t for everyone, but they are a nice gesture. If your father daughter dynamic has been basically tat-free, this is a good tattoo to start with. 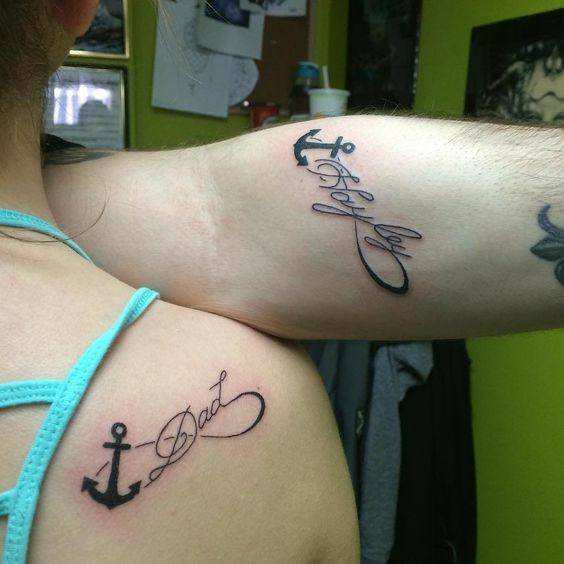 This is the perfect tattoo for the strong father and daughter who have been through it all together. 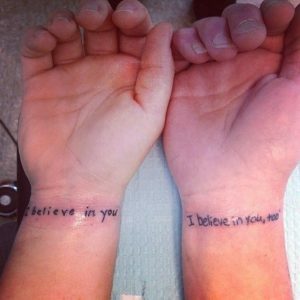 This is a good choice if the father is his daughter’s number one support and is always encouraging her to chase her dreams. It will be a sweet reminder to the daughter that she has nothing to fear. And, if she falls, he will catch her. The religious father daughter duo may want to put their faith into their tattoo design. And, this is a great tattoo for that! The cross connects to the heartbeat, creating an artful heart on the end representing how faith and love for each other and God are in their hearts. “You are my sunshine, my only sunshine” is a wonderful tattoo for the hippy happy father daughter pair. This well-known song tells that even on the worst days there is someone that can make you smile. 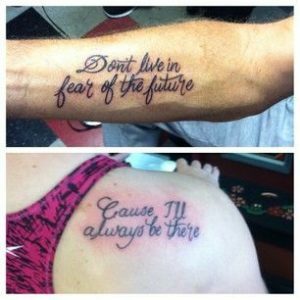 And, if that’s your dad, then this is the perfect tattoo for you. The love between a father and daughter is endless. These cute script tattoos written in each other’s handwriting will remind you that you just couldn’t have more love for each other if you tried. Some girls have always taken after their dad; Even from a young age, relatives would say, “Wow, you’re just like your dad”. If this describes you, you’ll definitely want to get this tattoo inked on your skin. 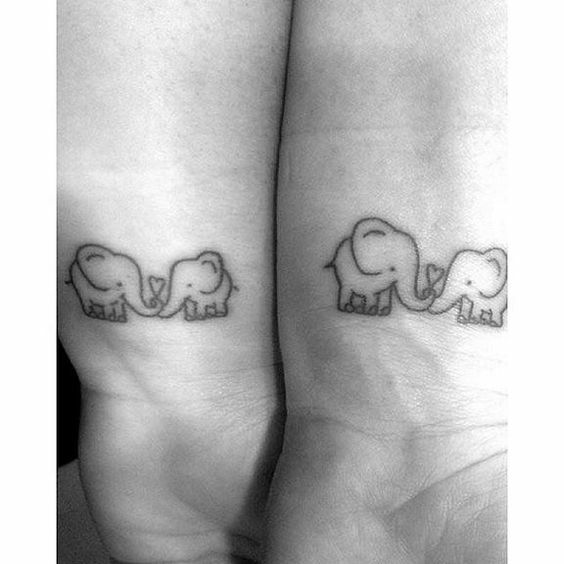 These cute little elephants are perfect for the animal lover father daughter couple. 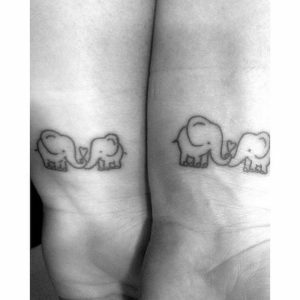 It shows a father and a daughter elephant holding a heart between them symbolizing the love that they share for each other. 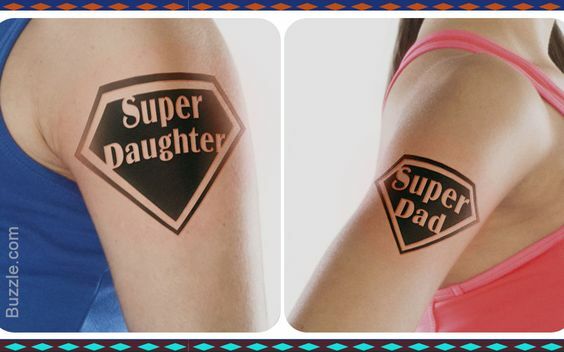 This tattoo design pair is definitely for the music-loving ‘cool’ dad who thinks he’s still a stud! 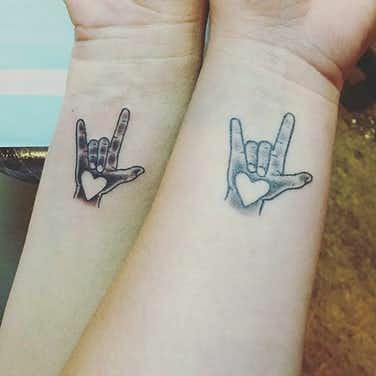 This tattoo is fun and playful and not only represents your love for each other, but for your shared love of music, which you most likely bonded over as he blasted 70s rock in the car while dropping you off at school. Bees are a great representation for love. They are strong. They are nurturing. And, they work as a team with the other members of their hives. 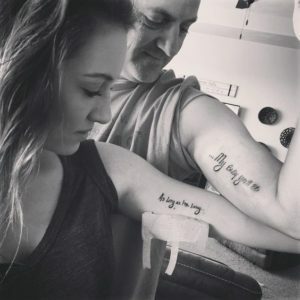 That’s why getting a bee tattoo with your father will show your strong affection for your dad. 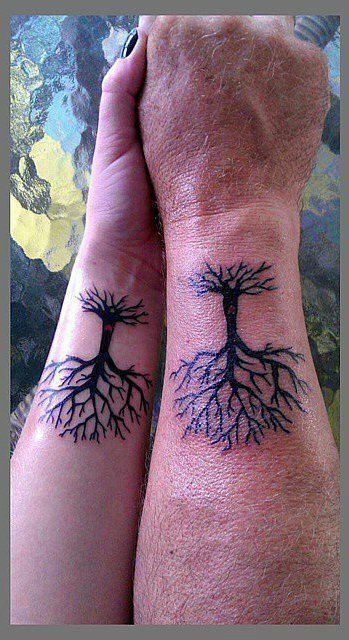 This tattoo is for the nature-loving father-daughter pair. 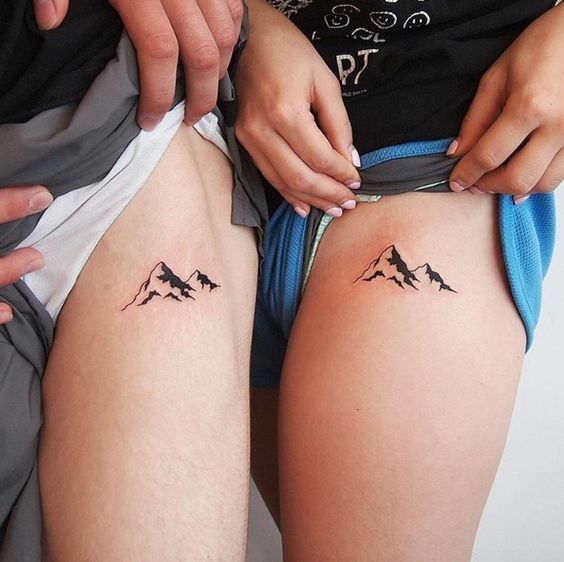 The mountains can symbolize your love for the outdoors, while also representing the humps in life that you must get through together. It will remind you that your dad will always be there to help you climb all the unclimbable hills in your life. And, he will never let you fall. 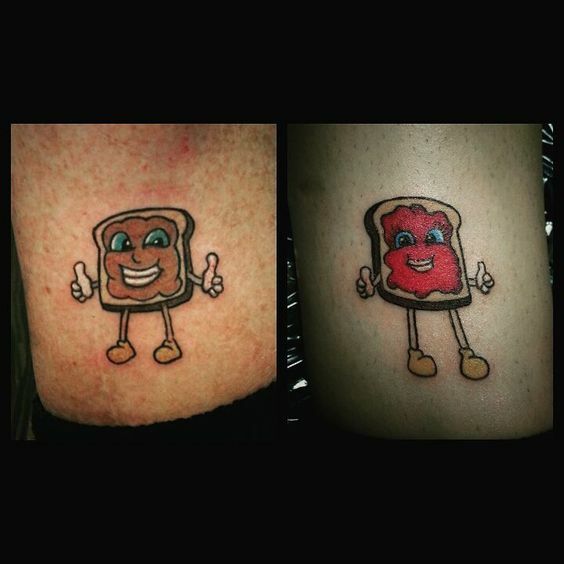 This silly tattoo is for the funny dad who loves a good dad-joke. It is also will remind you that when you leave, you will always be back. It’ll just be a little while until you see your daddy again. The infinity tattoo is simple and perfect for the father-daughter who don’t want to be elaborate in their design. It represents so much in such a little space. 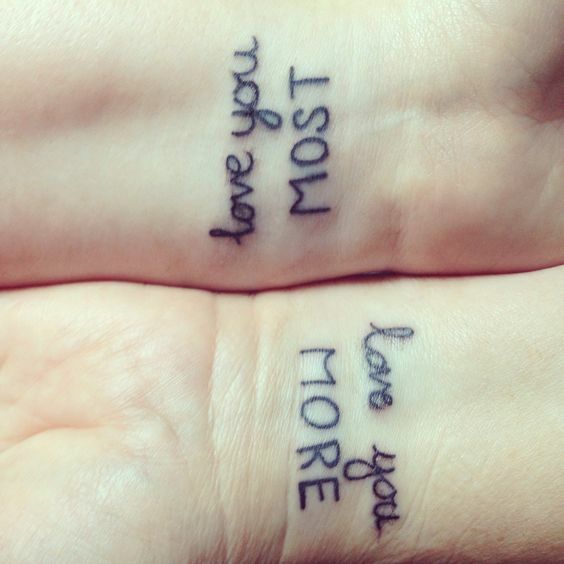 It means that you will love each other forever, be there for each other forever, and care for each other forever. Your love is infinite and nothing could tear you apart. Believing in someone is one of the biggest forms of love you can give to someone. By putting this original script on your wrist you will aways know that you both believe in each other. Sometimes the grown-up needs to hear it too! A compass is a great tattoo idea for the father-daughter duo who loves to travel. 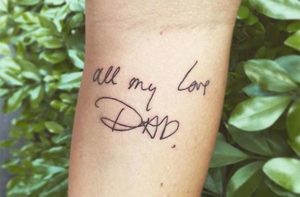 But, it also represents the fact that no matter where you are in the world near or far from your dad, he will always be with you to guide you and to care for you. Love doesn’t feel distance. Dandelions are a universal symbol for hope and wishes. 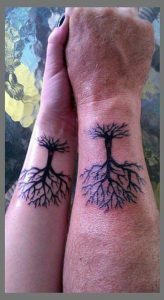 And, this is a wonderful tattoo idea for the hopeful wishful father-daughter pair. 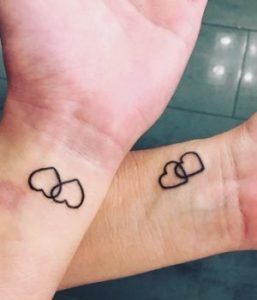 This tattoo will represent that you are always positive thinkers who wish the best for each other. 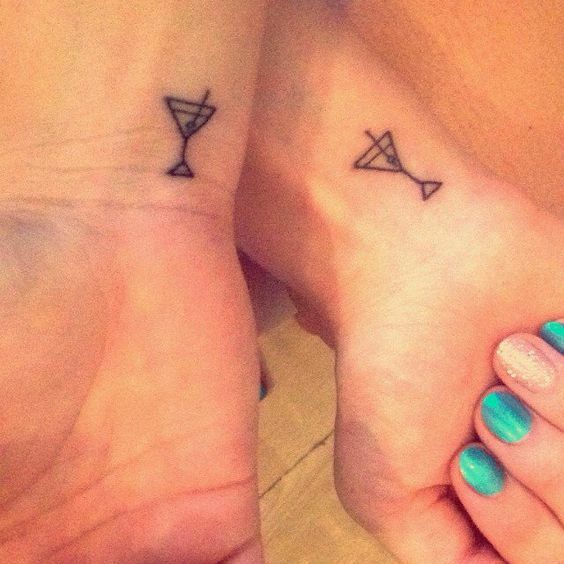 These cute little martini tattoos are for the father and daughter who like to have a little fun! It may not symbolize something deep, but the idea of spending time together, letting loose, and being able to be yourself with someone is priceless. This tattoo is for the daughter who’s father has passed away. Not everyone gets the gift of having their father throughout the different stages of their life. 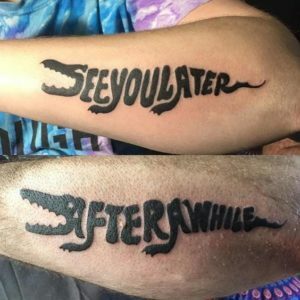 And, this tattoo serves as a great memorial for the man you may be missing. 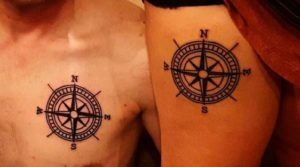 You and you father might decide that it would be special to get a tattoo together that will commemorate your whole immediate family. 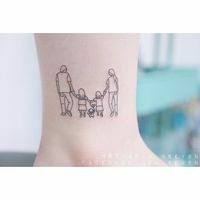 This family image is simple and striking and holds so much heart within the inked lines. 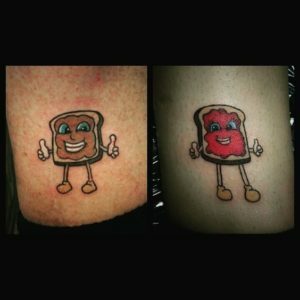 Peanut butter and jelly tattoos not only represent how perfectly you and your father go together, but it also is a great representation of a childhood favorite. Also, the thumbs up on the little slices of bread are kind of adorable! 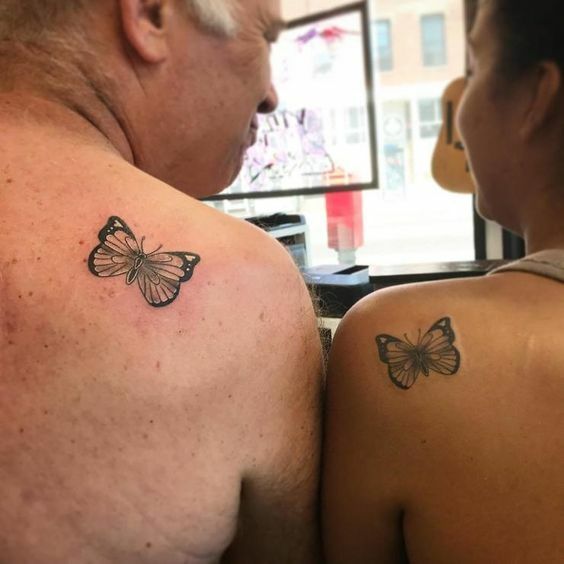 Butterflies are a great family tattoo because they symbolize growth and a new start. 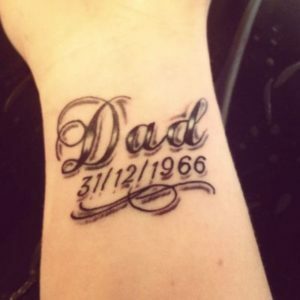 If you and your father have recently reconnected, this is a beautiful way to commemorate that newly formed bond. 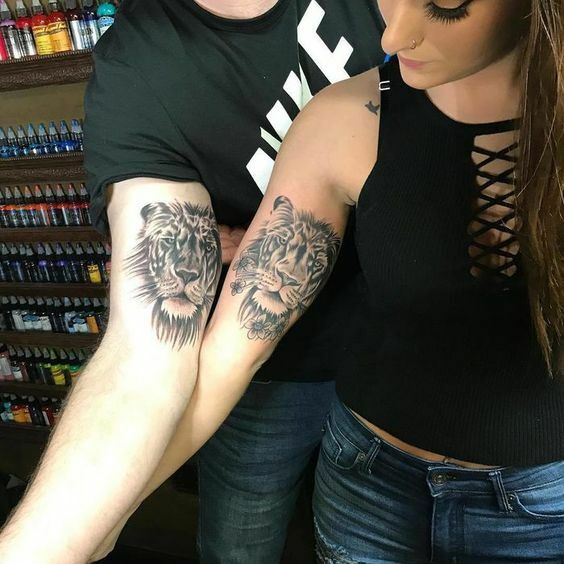 The father and daughter pair that rocks this lion and lioness tattoo will be considered totally badass. These are the kings of the jungle, so there is no messing with the love between this duo. Every princess needs a king to save her every once in a while. And, that’s just what these two tattoos represent. 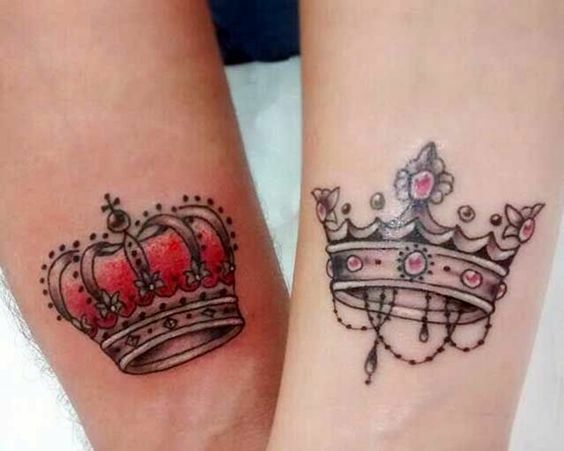 So, if your daddy treats you like a princess, this is the tattoo for you! Every girl needs an anchor that holds them down when they feel like they are floating away. If that person for you is your dad, then these anchor tattoos are the right choice for your tattoo design. Also this design gets bonus points if you grew up boating with your father or if you are just both really nautical. Hazzah! It’s Super-Daughter and Super-Dad to the rescue! If you and your father often work together and act as each other’s superheroes then this tattoo design will definitely represent that. I mean, really, besides Dad, who else do you really need?